The 10 Most Expensive Bottles of Water EVER! Would you pay a fiver for an Evian? We tracked down the 10 most expensive bottles ever sold. Although not all of them are still around for your drinking pleasure (what a shame! ), we thought that they belonged in this Hall of Fame/Shame/Whatever you would like to call it. I also converted all the prices to GBP. Considering our recent booming exchange rate, imagine how expensive these bottles could have been! 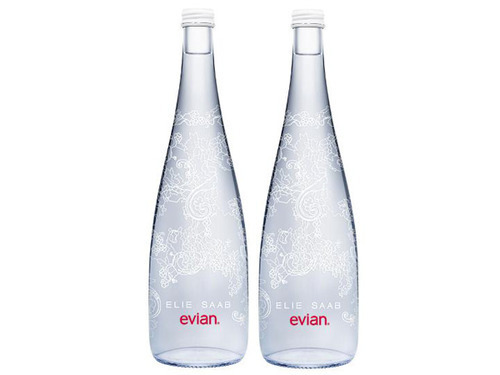 French water company Evian (which ironically spells naïve backwards), launches a new special edition bottle of water each year. This year, they collaborated with Elie Saab, to grace us with a bottle which is perfect by nature. The aim is to look like the 1 year old version of yourself like in the adverts. Tasmanian Rain is a bottle of premium rainwater that is sourced from Tasmania. Who would have thought? Launched in the United States in 2009, you can actually find this water in hotels and restaurants. There is some science here, apparently. Tasmania is an Australian island that is known for having the cleanest air on the entire planet according to the World Meteorological Organization. According to AquaDeco, their goal is to find spring water so pure that it doesn’t only sustain your life, but improves your life expectancy. Immortal Water,kids - it’s the future! To get to the secure, environmentally protected watershed from which this water is collected, one must travel through the Desolation Sound in the Coastal Glacier Mountain Range. Fancy huh? Veen water is said to be so unusually smooth that it is a surprise each time you take a sip of the water. Sounds a bit similar to what people say about vodka shots, but I usually remain a tad disappointed with the smoothness. This desalinated sea water is collected from 2,000 feet below the surface of the ocean off the Big Island of Hawaii. Known for its weight loss, stress reducing, and skin improving qualities this water is most exclusively found in Japan. You will look like the little ladies in this picture after a couple of swigs. Apparently this is some of the cleanest water from a Tennessee spring. Bling H2o, created by Kevin G. Boyd is a brand of water that uses Swarovski crystals to highlight the luxuriousness of the frosted bottle, setting a theme for the rest of the bottles yet to grace us with their presence. Wow. Nothing needs to be said here. A favourite amongst celebrities who like shiny things, this Fillico Jewelled Water bottle is covered in Swarovski crystals placed in pretty patterns. The water is produced in Osaka, Japan, however the shape reminds me of the coloured sand bottles that I could create in a market on Blackpool Beach. In case these other “semi-affordable” bottles of water didn’t peak your interest enough, maybe a £35,500 bottle of water will. Yes. £35,500. That isn’t a typo! . This bottle of water is made 24 karat solid gold, making it not just a thirst quencher, but a substantial asset investment. You can also find this bottle of water in gold matte, silver, silver matte, and crystal variations. Each bottle of this luxurious water comes with a leather case. The water is also gold standard. No, really - it actually has five milligrams of gold dust inside of it. Each GiveMeTap bottle gives 5 years of clean drinking water to a person in Africa. With just a few quids, you get a stylish bottle that you can bring everywhere and, at the same time, you change someone's life FOREVER!!! Now, that's priceless. Moral of the story: Save up for your mortgage and change people's lives! Use GiveMeTap bottles!